This is a two-part post in that I want to say thank you to all my readers for your continuous support in achieving over half a million site views along with providing some advice/guidance to players who wish to take the plunge into WordPress and start their own PAD blog. When I first started Mantastic PAD in mid October of 2015, my goal was to create content that was accessible and entertaining for all Puzzle and Dragoners. I had around 200 views per day for the first two months with the vast majority of views coming from Facebook referrals (a large majority probably came from me constantly refreshing my page to see how the small changes I made turned out). My content was somewhat fragmented as I tried to jump all over the place as I had so much I wanted to write about. In addition, my writing style was not as polished nor was my direction as focused as it is today. Despite a slow start, I stuck with writing and posting along with discovering what kind of content people wanted to read. As such, I was able to create articles and guides on popular topics and transitioned away from a blog-style format. This allowed me to devoted most of my focus to helping other players progress through the various dungeons as well as providing commentary/analysis on changes in the meta. As mentioned earlier, most of my initial views came from Facebook referrals as there is a large and established PAD community. Over time, I started to be picked up by search engines due to the increased site traffic and I currently experience the majority of my views from Google clicks. In addition, I experienced a sizeable influx of views from Reddit due to my inclusion in their Skill Inheritance Guide along with numerous Xiang Mei discussion posts and I am thankful to everyone who references my work. As Puzzle and Dragons continues to grow, more players will start to dream about starting their own PAD blog. I strongly believe in the power of written content (partially due to my own shortcomings with technology) and I always enjoy reading more about my favourite game and the differing perspectives players have. As such, I want to provide some advice for those who want to dive into the world of WordPress and even if you choose to use a different medium (YouTube channel, Live Stream, etc. ), the following points will still be relevant. Who are you writing for? Is it yourself, beginners, IAP-free/light, etc. Determining your target audience will influence your writing style as well as the content you produce. You need to produce meaningful content that people want to read. Furthermore, you need to do something to stand out amongst the crowd. Why should people want to read your content? What unique aspect do you have to offer that will entice people into reading your posts? Ideally, you want to be known for XYZ. Not only do you have to be consistent with the style of content you produce, but also how frequently you post material. You ideally want people to bookmark your site and have them visit every few days to see if something new has been written. This does not mean you have to post every day, but instead, post on a regular basis. I would suggest every 3 days as you do not want to force yourself. It is also better to produce a high quality article instead of several mediocre ones. Furthermore, you do not need to advertise yourself on Facebook as soon as you post something, but can stagger your sharing to give the impression you post regularly. No, I am not talking about your own charm and good looks, but rather the visual appearance of your site. You could have the most amazing content in the world, but if it looks terrible, most people would not want to read it. Make the most of your feature images (these are also the image previews you see when linking your post) and sprinkle in a relevant screenshot here and there to help break up lines of text. This will take practice, trial & error, and experimenting with the various themes offered, but is worth the time and effort. In order to become a notable member of the PAD community, you have to interact/contribute to other community sites. I am not saying you should shamelessly self-promote in the comment section, but rather have your name become more visible as well as contribute to the discussion. Like PAD, starting your own Blog takes time. You will not miraculously have thousands of views every day and you need to stick with it. Keep writing meaningful content and views will begin to flow in naturally. Mantastic is here to help! So now that you have got your site up and running, I want to help you out. Whether it comes in the form of advice or referrals, I want to help give a jump-start to your progress. I am open to the idea of featuring your content on my site as a means to help redirect my readers provided that post is meaningful and not something I have already written about (if you use a different medium, feel free to contact me if you can supplement a specific post of mine). If you continue to create content on a regular basis, I will also include you in my Community Corner page as I plan to update it every few months. 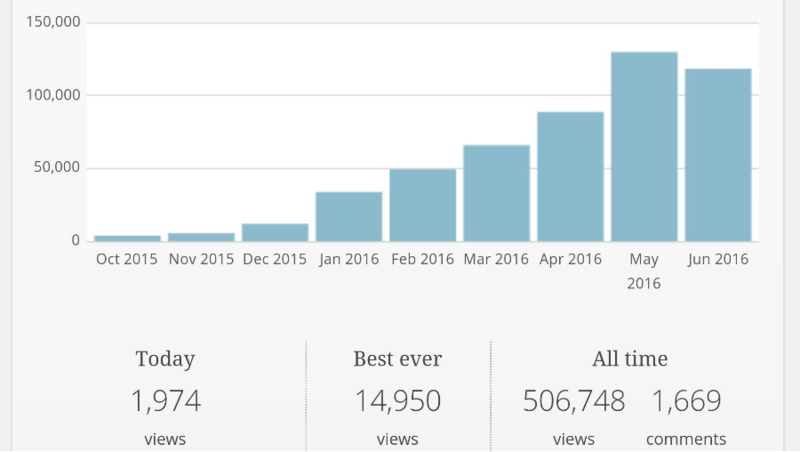 producing meaningful and Fantastic content and look forward to the next 500,000 views! For those who are starting their own site, I wish you the best of luck and hope you stick with it. Previous PostThank You Skill InheritanceNext PostGemstone Princess Series: Next Generation for Damage Enhancement? When I come to your articles (I get email notifications), it says “Be the first to like this!” Since I like being first at things, I click the button! Does liking all your posts help at all? I’m not even faking it most of the time! (j/k I like all your posts =P)… I’m not sure how the likes factor into the WordPress ecosystem for elevating your views and whatnot. Anyway, grats again, big milestone! This blog inspired me to start a Destiny wordpress. I write professionally for a Yugioh strategy site, but I’ve discovered that a standalone blog is an entirely different environment. Definitely a learning experience in pacing and promoting content. I’m used to a schedule with strict deadlines, a large and well-developed platform, and having all of the promotion done for me. Actually, not having an editor feels strange after working with one for years. Love the blog, the layout, and of course the guides, reviews, and discussions here. Its definitely helped me wrap my head around the complexities of PAD. I went from Rank 70 in November after playing on/off since 2014, to Rank 250 with tons of Descended clears. I’m sure I’ll be reading more as I prepare for Arena runs, build new teams, and link articles to my friends who are all at different stages in the game. Thanks for being super helpful. Congratulations on 500k views, what a milestone! And a well-deserved one, too; I love all of the content you have put out and always look forward to your next post (tbh I sometimes check for a new post multiple times in a day 😜). I hope your blog continues to be even more successful! Keep up the good work! I am thrilled to know you check back in on a regular basis and grateful to have you as an active reading and comment-er! Congrats on the milestone! I have to confess that I don’t read every article, but the work you put into the blog is apparent, and it’s paying off. I just started a blog (for a different game though), but I’m sure the advice is applicable to it as well, so thanks! If you have read every article, I would be impressed =P There are hundreds of thousands of words to go through! As a long time reader, I congratulate you! This site has helped me so many times I can’t even count now, lol. I hope you stay this successful in the future and keep working on this site!